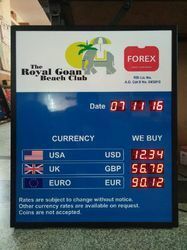 Our Electronic Currency Display Board use the latest and most cost effective microcontroller technology.They are a great way to help your customers keep abreast of currencies and exchange rates.We provide these products at market leading prices and in accordance with international standards for our esteemed customers. TC buying and selling . easily changable data inputs with wireless remote. corporate color and logo can be incorporated. 2. Periods & interest rates and currency rates can be changed through wireless remote. Compnay logo can be incorporated. 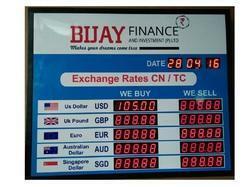 Looking for Currency Exchange Display Boards ?